VIAs high-frequency rail project is a great opportunity for an integrated rail network in the greater Montreal region. This would require shared access to the Mount Royal tunnel, which the Caisse refuses to consider with the REM project. Instead of fighting for track sharing at the environmental impact hearings, VIA decided to throw themselves under the bus train. How would HFR be an opportunity for Montreal’s Regional Rail? How will the REM affect the HFR project? Why did VIA torpedo the BAPE process and their own passengers? Canadians have long dreamed of High Speed Trains in the Quebec-Windsor corridor. Many studies were done, but the problem was usually cost: a 2011 study put the cost at 19 to 21$ Billion. With the appointment of Yves Desjardins-Siciliano as VIA CEO in 2014, the focus changed from speed to frequency. Instead of competing with flights, they decided to compete with cars. And in the short term, the new plan will only focus on Montreal-Toronto, and worry about Quebec to Windsor later. VIA also started a procurement process for new rolling stock that would be able to travel at 200km/h in diesel or electric mode, allowing gradual electrification. The hope is to get this project up and running in the fall of 2019. (holy cow, I’d like portfolio returns like that). “We’re not promoting high-speed-rail, we’re promoting high-frequency-rail, which means dedicated tracks on which only passenger services run. The map shows that the VIA and AMT lines overlap on the Vaudreuil-Hudson line in the West and on the St-Jérôme line in the North. So if VIA and the AMT could share these new, dedicated, electrified passenger tracks, this could be a great opportunity for the AMT to greatly expand service. The electrification makes operating trains much cheaper, which allows more frequent service. Electric trains are also faster and can stop more often, allowing the addition of more stops within the city. With updated signalling, VIA and AMT trains could run only minutes apart on the same track. Imagine: service from downtown Montreal to Parc-Extension, Chabanel and Laval, every 10 to 15 minutes all day long. In the North we could create a new rapid transit line serving new areas while relieving the overcrowded Orange Line. In the West of Montreal, we could implement the Train-de-l’Ouest project that West Islanders have been demanding for decades: frequent service on the Vaudreuil-Hudson line, with the possibility to serve the airport as well. And the cost for all these upgrades could be shared with VIA, whose higher-paying passengers would finance a large amount of the capital costs. We would get new transit lines almost for free. 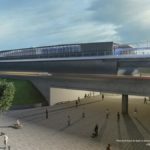 The REM proposed by the Caisse de Depot adds a giant snag to this plan. Instead of adding to the synergy of the regional rail network, the Caisse is doing its own thing and destroying regional network opportunities. The big issue is the sharing of the Mount Royal tunnel. VIA, AMT & REM could all use the tunnel, which could provide a high-capacity trunk line through Montreal serving the whole region and cities beyond. But the Caisse wants to privatize the tunnel and monopolize it. They insist on converting it to an incompatible technology, citing regulation and the need for frequency. But the automated light rail technology to be used by the REM and the heavy rail technology used by the other lines could be made compatible with each other and provide service at high frequency. Some might say it’s crazy to have all these lines share a single tunnel. But consider that the REM and AMT will each only need a capacity of about 20,000 passengers per hour per direction (PPHD). Since two-track rail tunnels can accommodate 40,000 to 60,000 PPHD, it makes a lot of economic sense to have all lines share the same tunnel. But the Caisse stubbornly refuses to consider this option, and its privatization and monopolization plan appears currently supported by all levels of government. 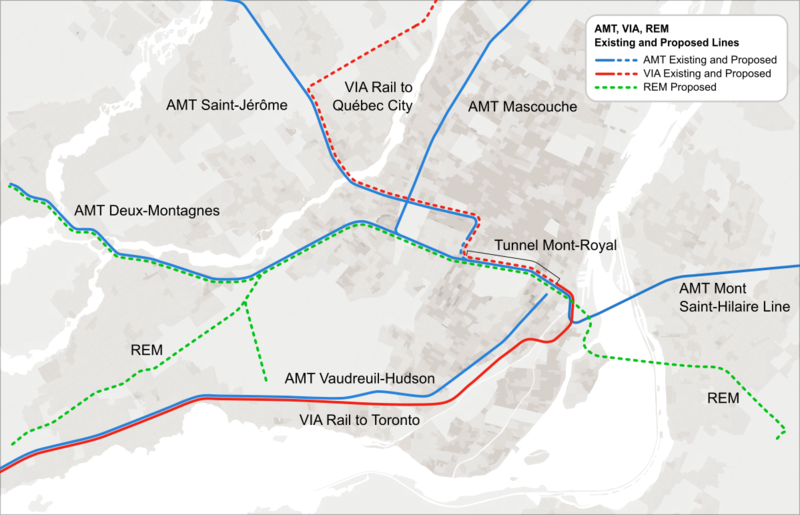 If the Caisse monopolizes the tunnel, the synergies between VIA and the AMT fall apart, and so will the chance for a large regional network. Since then, the issue of track sharing has come up numerous times. VIA itself has said that track sharing is technically possible if VIA and the Caisse sat down and designed the project together. They provided numerous examples of heavy and light rail sharing tracks, to show that is possible technologically. They also provided examples that show that it is possible to circumvent get around the regulatory issues for sharing of light and heavy rail. CDPQInfra has simply dismissed this possibility. For instance, Jean-Vincent Lacroix, claimed the example of the O-train in Ottawa is not a relevant example because it has a different frequency and traction system than the REM — but completely misses the point of the example, which is to prove the willingness of Transports Canada to give waivers to antiquated rail-safety regulation if it is proven that safety can be provided by other means. At the environmental assessment consultations, the BAPE hearings that ended last week, numerous experts came forward and described the possibility of track-sharing between REM, VIA & the AMT. Several environmental and municipal groups demanded track sharing as well. Just days later, on the last evening of the hearings, towards the end of the session, VIA gave a presentation at the BAPE as well. They did not submit a brief beforehand, and only made a verbal declaration (for video, see Jeudi, 29 septembre 2016, 19:00). Given the importance of track sharing, and how VIA has talked about the possibility of track sharing, most people expected that VIA would bring it up again. After all, the reason of the BAPE is to identify possible impacts, and to make recommendations to reduce them. It was a perfect opportunity to get the commission to recommend that the Caisse should investigate track sharing. But at the BAPE, CEO Desjardins-Siciliano affirmed the opposite. Desjardins-Siciliano claims to advocate for “sustainable transportation infrastructure for the 21st century” as the “longer-term objective”, yet in the same breath pushes for the destruction of any possibility of an integrated regional network in the long term. The commission seemed to be quite puzzled at these statements, given the many people who talked about track sharing before. They asked Desjardins-Siciliano numerous times about VIAs plans and the REM impacts, and the VIA CEO would merely repeat the same words over and over. For any transit advocate interested in regional integration and concerned about the long-term effects of the decisions of today, this is a really frustrating hearing to watch. It felt like VIA Rail was sinking their own ship (and taking all of us with them). However, despite all the obfuscation, VIA’s CEO eventually did admit that their plans included the use of the Mont-Royal tunnel to reach Quebec City, and that it would have significant time savings, “we have an edge of one hour”. “…if it would cost 3-5 minutes of that hour (to transfer), this would still remain an important difference, so that most people would take it, independently of a transfer”. He also kept repeating the fiction that forced transfers will not have an impact as long as you integrate tickets. VIA rail could have just said something like “well it would be nice to have shared access to the Mount Royal tunnel, but if it is not possible, we can find a way around it”. But it took them several questions from the commission to even admit that it was in their plans. Why would they argue so strongly for the project in its current incarnation, be so dishonest about the impact, and simply not answer questions regarding the technical feasibility of track sharing at all? We can only speculate, and may never find out what happened here. Or maybe it was an order from above to get in line. 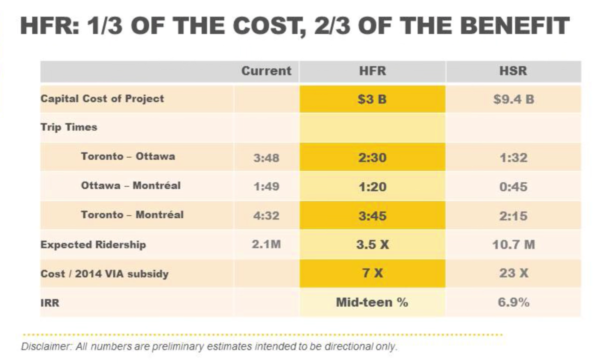 Or more likely, maybe the Caisse promised some funding for their HFR project if they shut up about problems and get in line. After all, VIA did hope for private funding of their project, given that governments don’t seem very eager to invest in rail infrastructure. 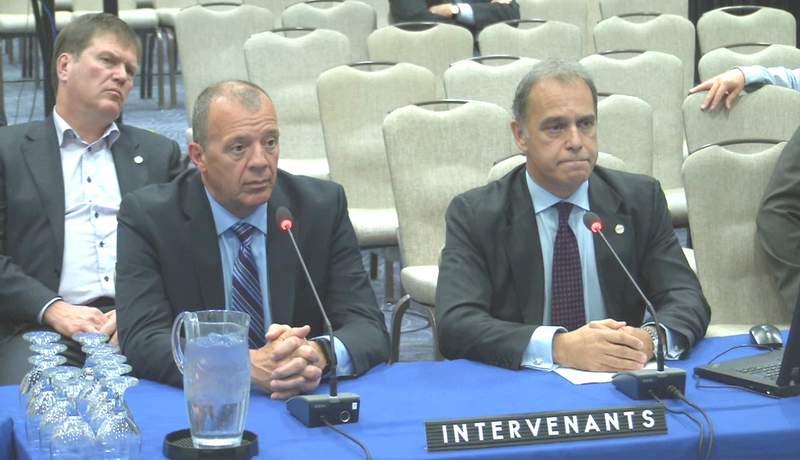 VIA’s presentation describing the project was done at a PPP conference, and Desjardins-Siciliano promised a high rate of return to investors. 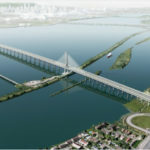 And he did describe the REM project as “bittersweet” when it first came out, as it had shifted the infrastructure funding priorities of the Caisse away from VIA. 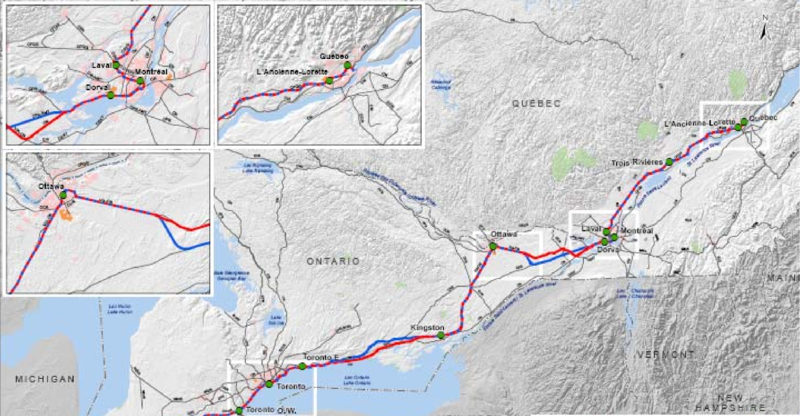 It would be especially cynical if the reason that VIA will allow the cutting of the Quebec-Windsor corridor in half, adding two transfers for anybody travelling through Montreal, if it is done to ensure funding of the HFR project in the short term — after Desjardins-Siciliano’s big pronouncement that we should not lose “sight of the longer-term objective”. 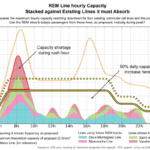 When the REM project was first announced, there were some rumblings from the AMT about how this will affect their network, but they quickly got in line. Now, with VIA also getting in line and torpedoing the experts at the BAPE calling for a shared, regional system between AMT, VIA and REM, it strengthens the Caisse’s case for privatizing the strategic infrastructure assets and building a line that will prevent building a regional network in the long term. How a private equity firm suddenly has so much power to make public infrastructure decisions against the long-term best interest of the public, against the warnings of expertise, how heads of big public agencies are made to make pronouncements against the interest of the people they serve – that’s the truly scary part. We could go ahead and build a shared system. The technical and regulatory hurdles aren’t even that big. But we don’t, because we are in the process of moving decisions affecting the public for decades outside of the democratic control of our public institutions and into the control of private equity. And we will only understand the impact of these decisions when it’s too late. Fascinating analysis. It certainly seems that VIA is marching to the beat of the same drummer as the Caisse is in their march to REM. Looking at the map, I can’t help but thinking that VIA will abandon any idea of serving Central Station at all and simply run down the CN St Laurent Sub to Ballantyne then out to Dorval and on to Toronto. It’s stupid, sure, not to serve downtown, but it’s not entirely their fault that people will have to transfer. Maybe they have a side deal for the Airport leg of the REM fantasy to extend to Dorval station. So how infeasible it it to expand the tunnel? I’d say much less feasible than just building a shared system. People keep asking me about this, offering all sorts of alternative solutions – that are usually much more expensive than track sharing. It makes no sense to spend an extra billion dollars on infrastructure because of agency turf issues. This is incredibly frustrating. Just about the only advantage VIA rail had over flights was direct downtown to downtown access. If I cannot leave Montreal from Gare Centrale I’ll never take a train again. Sad! Your concern here seem to be Montreal commuter trains…. Commuter trains are “presently” the 2nd cause of headaches for VIA trains, just after freight trains, as VIA trains often have to zigzag around stopped-at-station commuter trains. REM projetwill win the 1st position about treats to VIA trains. Hope that if VIA pays to have its own tracks and as much as possible on its own right-of-way, that it will not allow commuter trains to run on it!!! “My” concern is about my home town of Quebec City. It’s the REAL TREAT there. If the REM is built, it will kill definitely all hopes for decent passenger services to Quebec City in the future, and that, with Quebec City’s citizens’s money. It’s completely stupid to have a train running on an isolated line, leaving Quebec City downtown and terminating in a suburban transfer station, and doesn’t go anywhere else. It will be a flop. Quebec City train does not only need direct access to Montreal downtown (using the tunnel, please don’t talk me about loosing an hour running around the mountain), but also continue its run directly to Dorval airport (access to a lot of international flight that will never been available from small Quebec airport), Ottawa & Toronto without having to transfert to another train (or worst, to a REM + another train). In two words, I want the Quebec train connected to the continental network, not just Montreal or… its suburbs. The REM project need about 45% of federal and Qc provincial governments subsidies, one is owner of VIA, the other is owned at 10% by Quebec City residents and 40% of other non-montrealers. Note also that the money CDPQ considers “his money” is owned at 10% by Quebec City residents too. Don’t be surprised if Quebec City opposes to the REM project and contribute to kill that project. We’re maybe just 10%, but it’s hardly enough to make politicians backing up, those politicians who by default, try to find reasons to avoid spending billions everybody ask for. Hi Anton, Just started reading your blog – good stuff. We at Transport Action have a member writing a report on how to create a dedicated rail line for VIA along the Lakeshore route which we’re about to send to Transport Canada so it can be evaluated at the same time VIA’s HFR proposal is analyzed. Would you be able to do a Peer Review of it before it’s sent off? Having read this entire exchange, I as a holder of a Master’s Degree in urban planning can only shudder at the “tunnel vision” (no pun intended) of the various participants, but mostly at the effrontery of the REM promoters, who for private commercial gain, want to destroy the flexibility inherent on the present infrastructure facilities of Montreal. I was a resident of Montreal for over 25 years and did my Engineering Degree at McGill. After doing Planning at the University of Manitoba, I realized that we had a fabulous resource in older rights of ways from the various railways that operated in and around our great Canadian cities (many of which acquired these properties with government-public help). I wrote several articles in the seventies on that subject (yes, the seventies). Some cities have seen the light (Toronto, Montreal, Vancouver) and others wasted these assets for commercial and ill advised planning decisions. (Ottawa comes to mind). The Mount Royal Tunnel is such an asset. It is incomprehensible why any public minded politician would allow such a resource to fall into private hands, which would frustrate future transit planning. I think bluntly that Quebec City is being abandoned. It is a much smaller market than Toronto-Kingston-Ottawa-Montreal, so it’s simply not worth it for VIA to pick a fight over it. Montreal will be the end of teh line. Build VIA a new Gare Central at Canore, (there are train tracks from the airport to Canore)VIA trains don’t have to go downtown, and taking REM will allow access to all the other lines, and downtown… WIN-WIN-WIN. Matthew, I suppose you mean Canora at the end of the tunnel? Currently, that would mean going through the CSL train yards (nightmare for passenger trains on a schedule), go through a single-track loop that looks like it can only accept low speeds, make sure no AMT trains are crossing (St-Jerome line), and then above Canora there is no space to build a VIA Rail station and it has no metro connection and only a small bus line. More so, removing VIA Rail from the current Gare Central will make life a lot more complicated for business travellers that come to downtown Montreal for meetings / conferences / etc. which is a large group of travellers (= revenue). VIA lines from/to/through Montreal are 66% of the revenue (quick calculation based on 2015 report) for VIA Rail, so way too risky to experiment with an out-of-center central station. I’d love to see a second tunnel under the Mt Royal and have a large station underneath the new Outremont campus that l’Université de Montréal has started constructing. This way we can allow the St-Jerome line to actually advertise real time savings bringing suburbians to downtown Montreal and sharing the cost doing this. It also allows UdeM to finally allow people to come directly to work, instead of forcing the off-island people to make rediculous number of transits (my spouse used to live in Mont-Saint-Hilaire and going to/from work at UdeM was crazy long with public transit). But Gare Central definitely is a very crappy station and the long and decelerated approach slinging through St-Henri, PSC and Griffintown is a pain. This is a very interesting post. As we are well into REM construction a few years later, the decision is moot now, and no doubt the writer and several commenters are disappointed by the outcome. I have two questions for anyone who knows anything! 1.) I am intrigued by the comment from the Quebec City resident frustrated that VIA would drop him off in north-end Montreal, rather than downtown. But more than that, he seems frustrated that he wouldn’t have any prospect of the long-distance intercity services you see in Europe: a one seat ride on the same train from Quebec City to Toronto, that comes into Gare Centrale through the tunnel, loads and unloads, and then pops out on that Pointe St Charles curve, stops at the existing Via Dorval for the airport, and heads on to Ottawa and Toronto. While I admire the line-on-the-map simplicity of the concept, realistically, how many people in Quebec City want to do the latter? I would have thought that 90% of the train is getting off in Montreal, with relatively few people wanting to go on to Ottawa, let alone Toronto. Even with a faster rail system, that’s got to be a 6 hour trip to Toronto best case. Is that competitive with direct Air Canada flights from Lesage Airport to Pearson? or Porter to the Island? If 90 percent of the train gets off in Montreal, and then those seats are immediately filled by Montreal traffic heading to Ottawa and TO, aren’t we talking about a half-hour stop, minimum, in Montreal? Can all those dark, narrow Dickensian tunnels under Central Station handle all that 2-way foot traffic loading and unloading? A station at “Correspondance A-40” immediately adjacent to the REM doesn’t sound so bad to me. Quebec City VIA traffic gets off there and be on a super frequent shuttle to the core that can’t take more than 15 minutes. 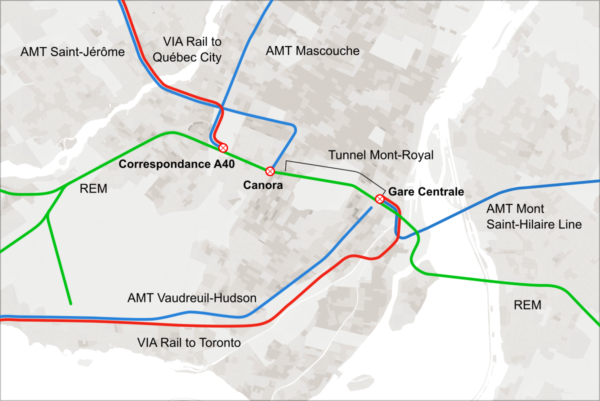 Plus the A-40 VIA station itself would be more accessible to the entire Montreal metro region, more scope for long-term car parking, etc. PLUS, if you’re going to YUL airport from Quebec City, again the REM could get you there very quickly. 2) Does anyone know if the Caisse has bought up, or will buy up, the industrial land where “Correspondance A-40” is? (I see a Parasuco factory on Google Maps, for instance.) There is quite a bit of low-intensity industrial park land I see there, ripe for redevelopment and densification. I like the idea of VIA combining regional rail and the idea of two-for-the-price-of-one federal funding as conceived in this blog post is interesting, but the Caisse has been so bloody-minded on this that Montrealers seem likely to have actual trains to ride on much sooner than I would have thought — which is supposedly one of the upsides of privatization, if executed well. (If we count the Caisse as “private”).